Despite the weekend hordes that descend upon Broga Hill in Semenyih for a predawn climb and sunrise views, few venture on to Gunung Tok Wan, even though its trailhead is located just beyond Broga Hill’s peak. Joining the KL Hiking crew again, we started out at 7.40am having watched the sun crest the hills to the east. The terrain is the polar opposite to Broga Hill‘s barren grassland. 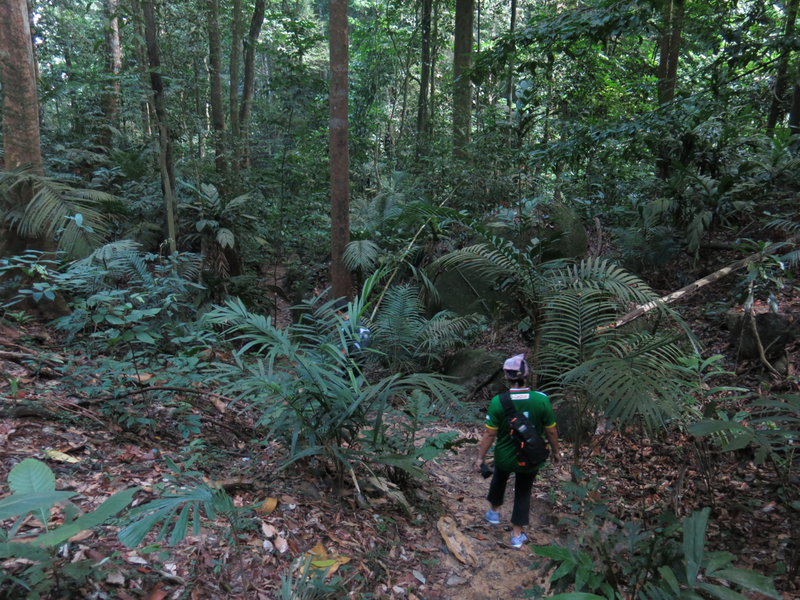 The trailhead, which begins at Broga Hill’s peak, right on the border between Selangor and Negeri Sembilan, cuts through dense brush and into the nearby forest. Up turned soil along the trail indicated the presence of wild boar. 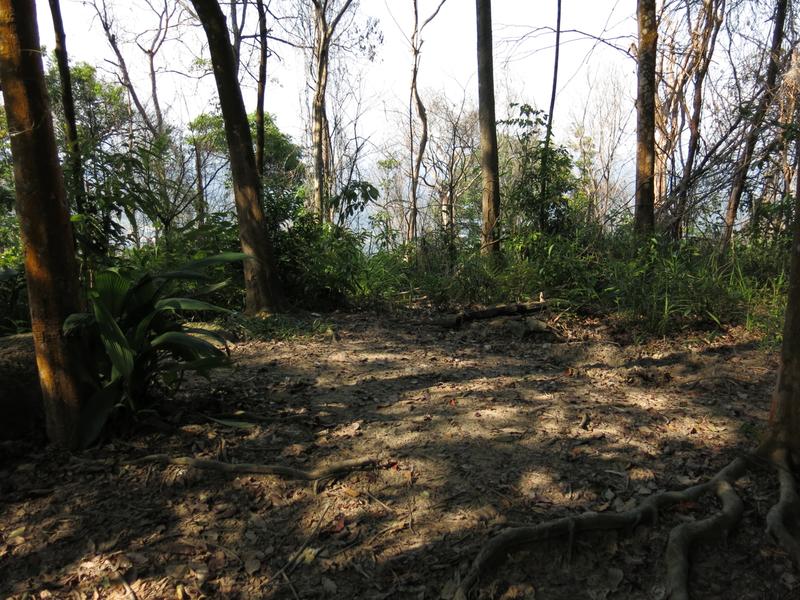 The trailhead is a tangle of dense brush. 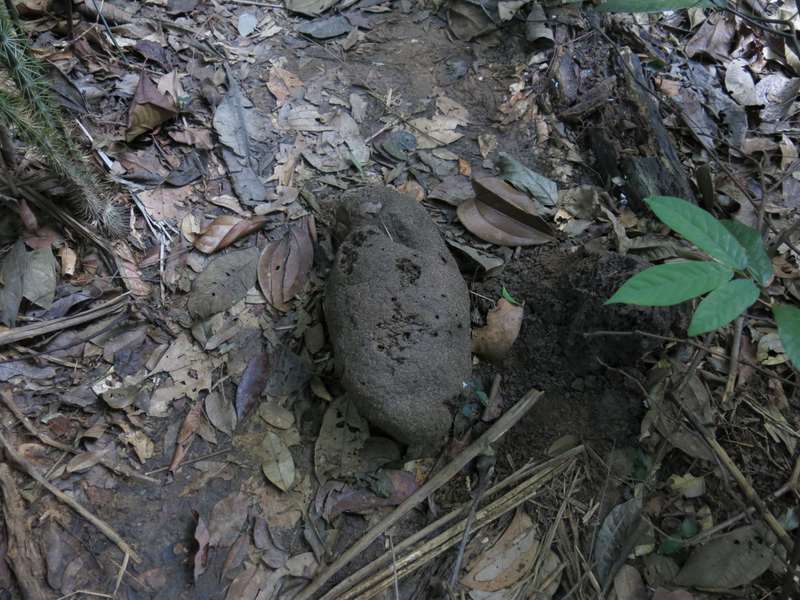 Turned up soil along the trail was indication of wild boar. With 60 of us, we were bunched up to begin with but soon spread out. The trail is mostly flat to begin with, then 10 minutes in, it starts to climb. 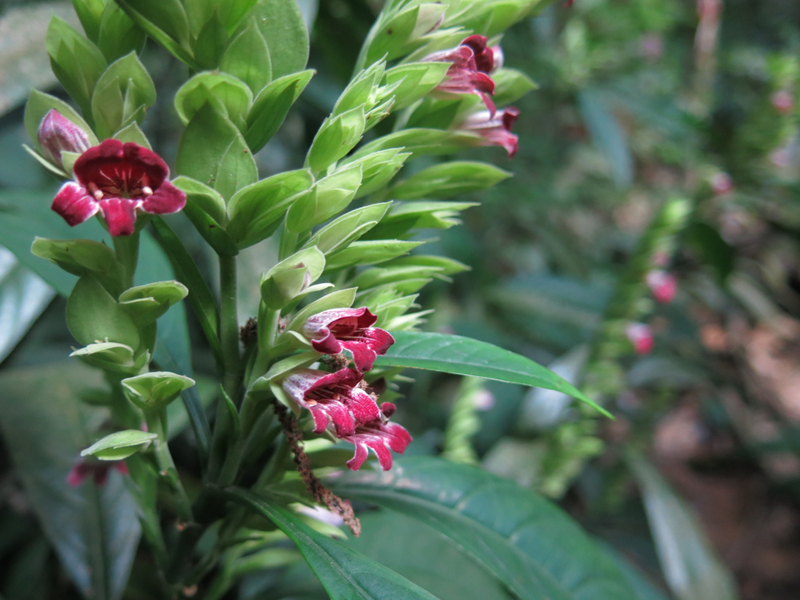 Bushes of these pretty flowers were spotted along the trail. 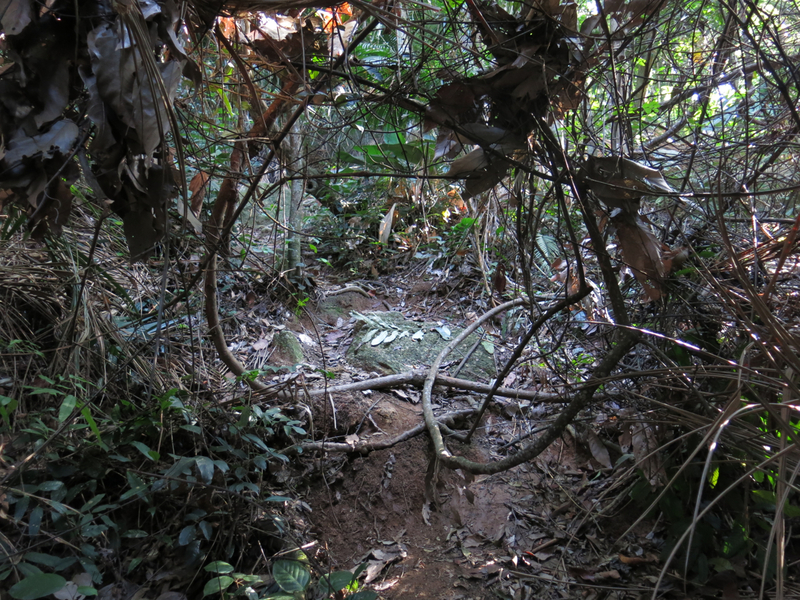 30 minutes later, just as I thought we must be making good progress, the trail descends into a gully of boulders and what appears to be a river bed. This marks the halfway point. The start of the descent into the gully. It’s all uphill from here and immediately after, the trail ascends steeply and almost continuously, seldom letting out, except in intensity, until the very peak. The only exception is one brief descent that has become synonymous with bees. I had heard about hikers getting stung along the trail and was wary of an attack, especially as I had forgotten to bring adequate protection. 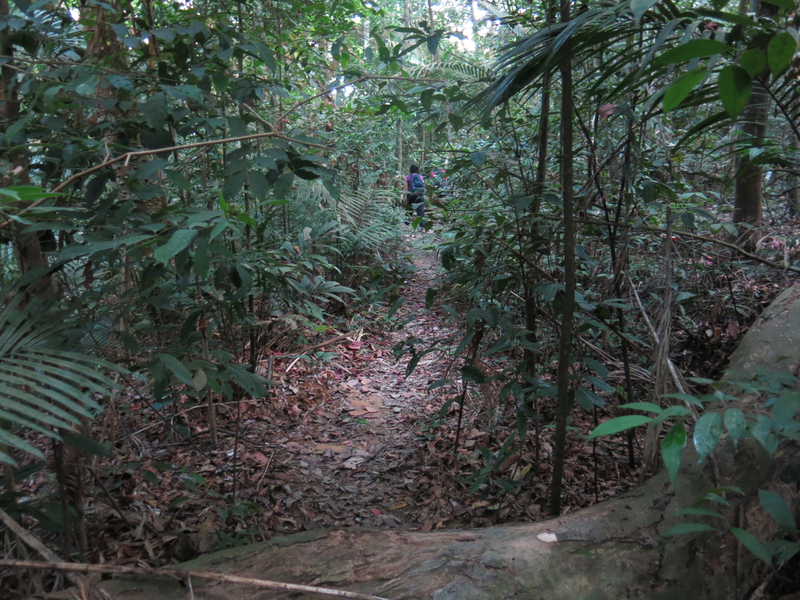 Fortunately none of the 60 or so KL Hikers on this trip we’re disturbed. 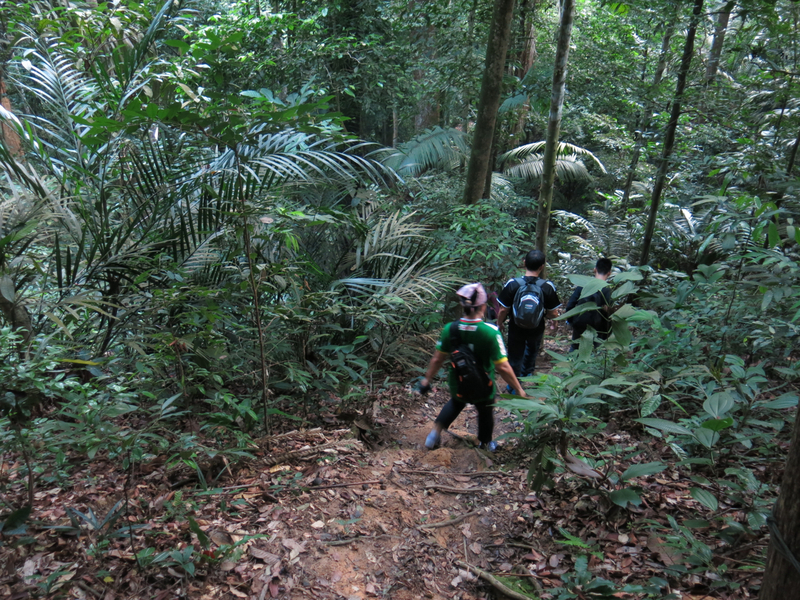 20 minutes later and 1 hours and 10 minutes after we started out we arrived at Gunung Tok Wan’s peak. 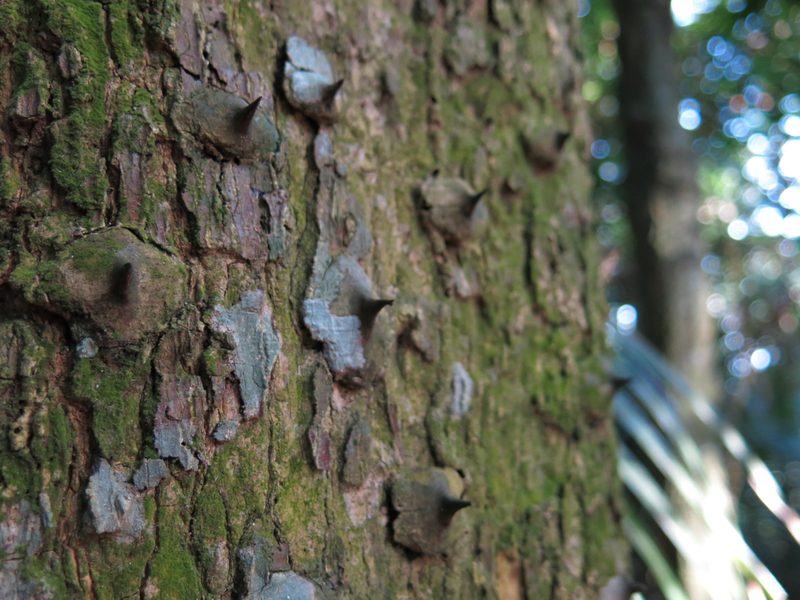 Ants make their way across a log at the peak of Gunung Tok Wan. 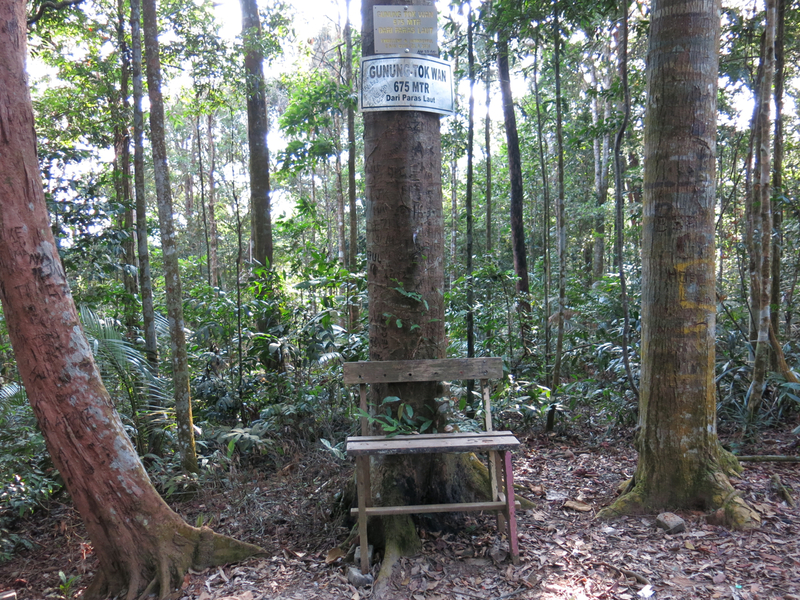 Now firmly in Selangor, the top of Tok Wan is little more than a clearing surrounded by tall trees. 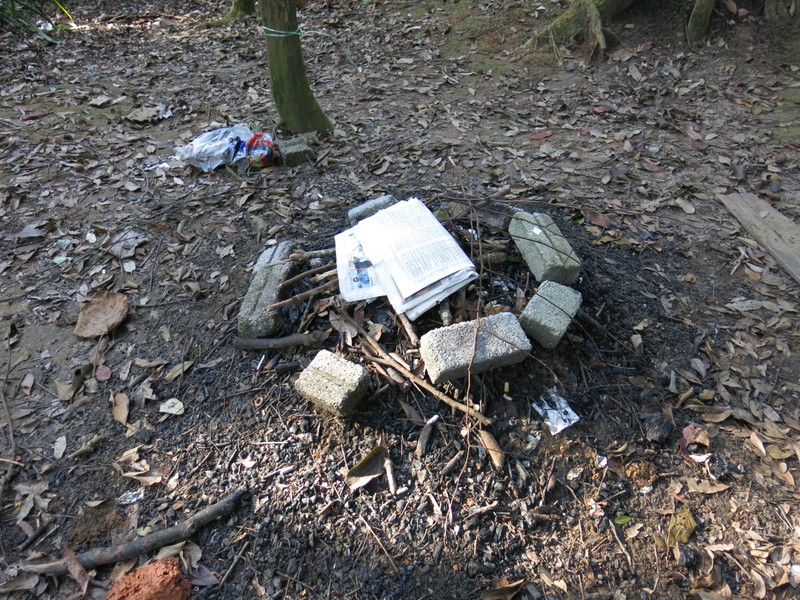 Remnants of a fire suggest it is used as a camp site. You’ll need a sit down after the climb. The remnants of a campfire. 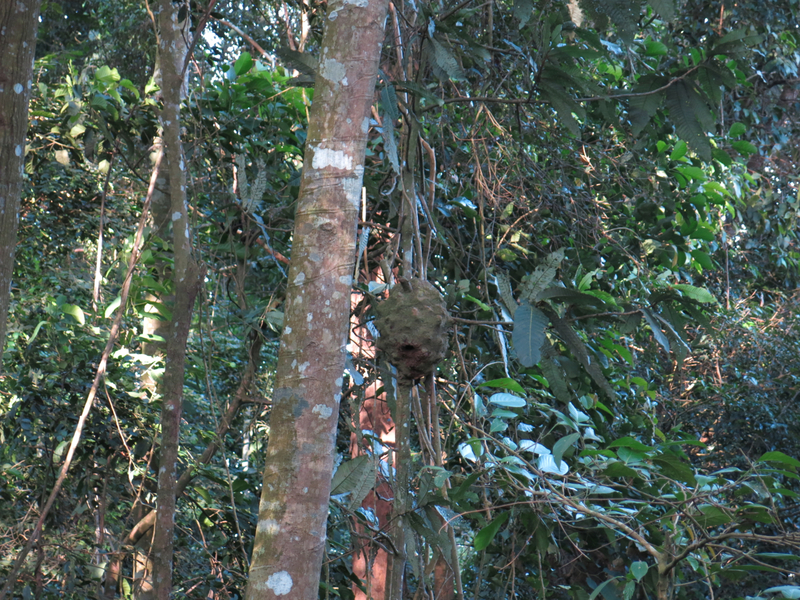 An abandoned hornets nest spotted near the peak. 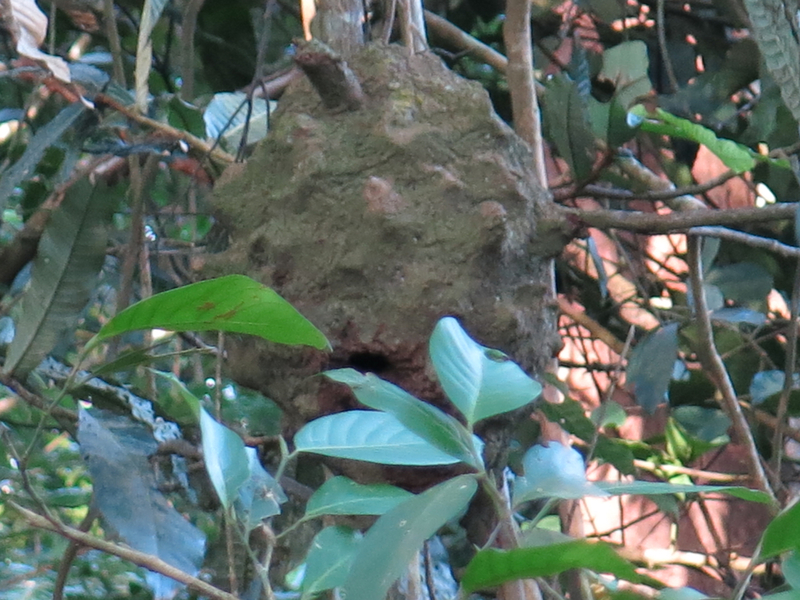 A close up of the former hive. Ugh – the stuff of nightmares. There are two other potential camp sites enroute: one near the trailhead, the other mid-way, however there’s no reliable water source. Potential campsite near the trailhead. Potential campsite located mid-way along the route. With no view, we didn’t linger long at the peak, and having caught our breath, we were soon running our way back down. The jungle isn’t always welcoming. Some flora is designed to protect itself. 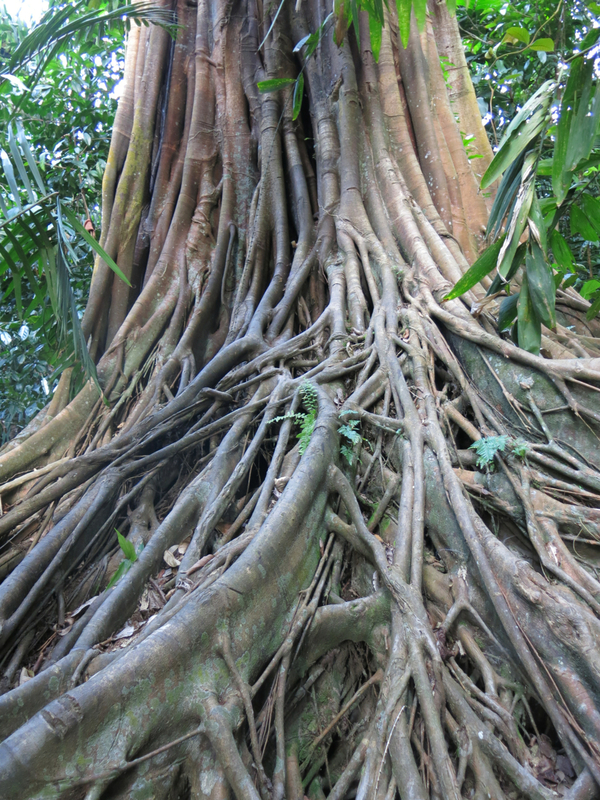 It was a race of stops and starts as undergrowth typical of secondary forests can pose a threat if due attention is not given – low hanging branches, sharp stumps protruding from the ground and roots that could trip you up all pose a danger. 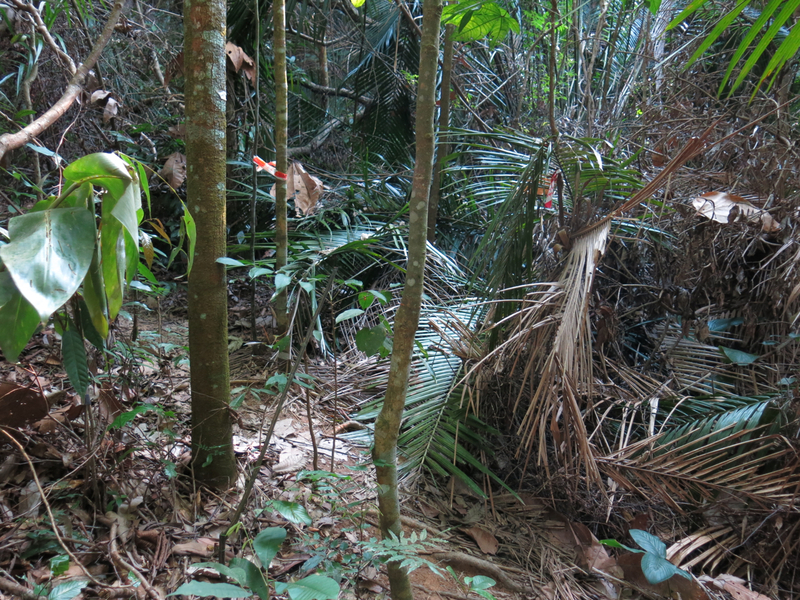 The dense brush that mark parts of the trail. Aside from that the route is pretty clear and easy to follow. 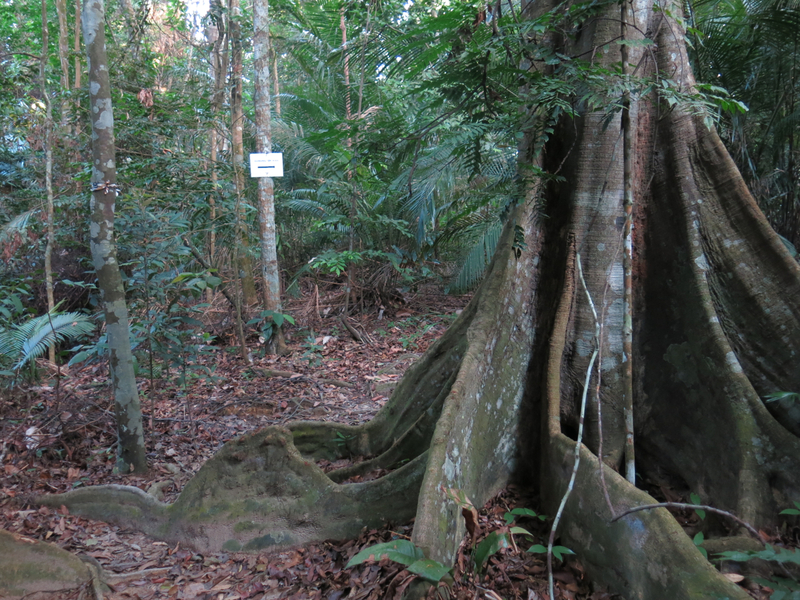 Makeshift signs hang from trees and strategically placed red and white tape is used to mark the trail and close off possible false trails. For all that, incidences of hikers getting lost continue to occur, with some as recent as last year, so don’t take things for granted. Follow the red and white markers. 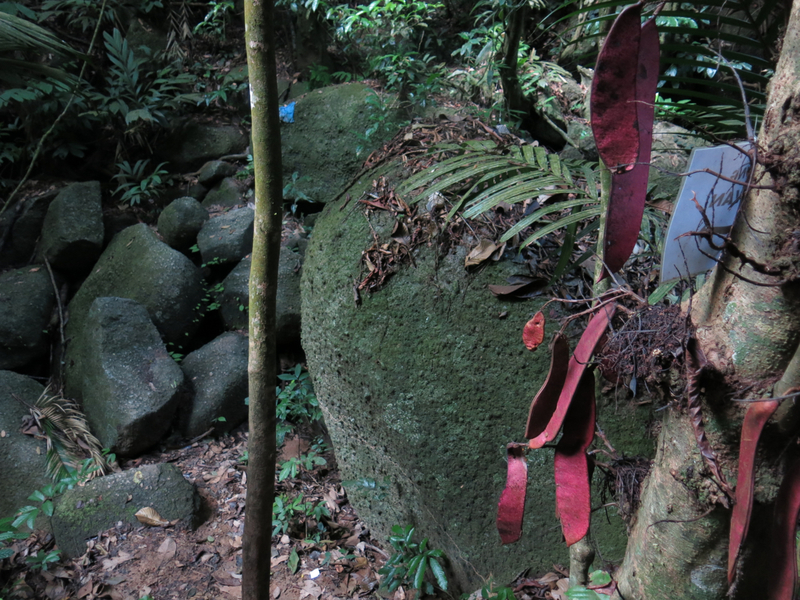 Altitude At 675m, Gunung Tok Wan is a mere hill rather than a mountain. Distance and time 3.1km from the peak of Broga Hill (4.8km if you factor in the journey from the carpark), the hike from the top of the hill should take between 1 to 1 1/2 hours one-way. However since you can’t get there without doing Broga Hill, factor in an additional 30 minutes to 45 minutes either side. Total time from carpark to carpark 4 to 5 1/2 hours. Total distance 9.6km. 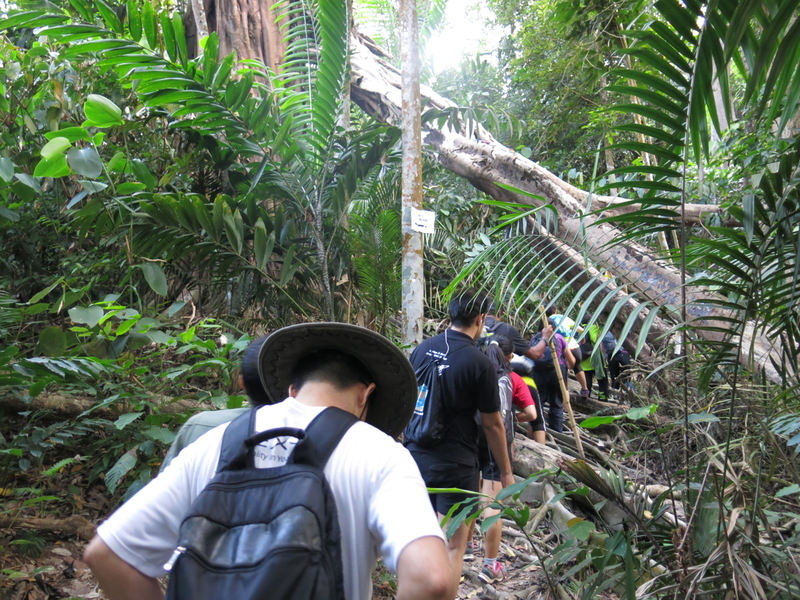 Rating KL Hiking rates the Gunung Tok Wan hike as moderate to hard. 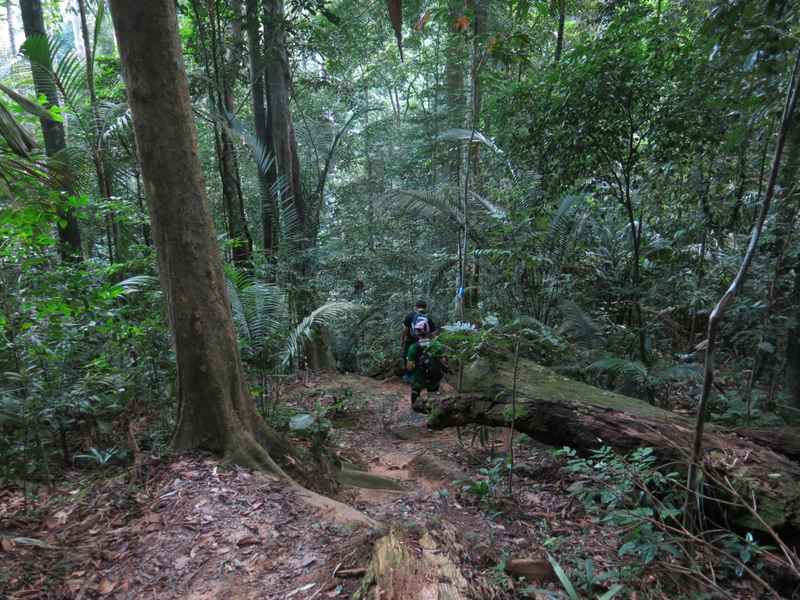 A gradual ascent condensed into a relatively short time frame Gunung Tok Wan is an intense challenge. 1. Manage your time Start your hike from Broga Hill as soon as the sun is up and keep track of the time. Even though this is a relatively short hike, hikers have become lost because they entered when it was still dark or attempted to exit too close to sunset. 2. Wear protective clothing A netting scarf or shawl should protect your face from bees should they decide to launch an offence. Pack it somewhere easy to reach. Post-hike reward The grilled fish at Broga Recreational Fishing Park is a popular lunch option. Getting there Not to be confused with Gunung Tok Wan in Sabah, aim for Rabbit Fun Land in Broga. The carpark for Broga Hill and Gunung Tok Wan is a palm oil plantation small holdings and is located almost directly opposite this petting zoo/rabbit farm. 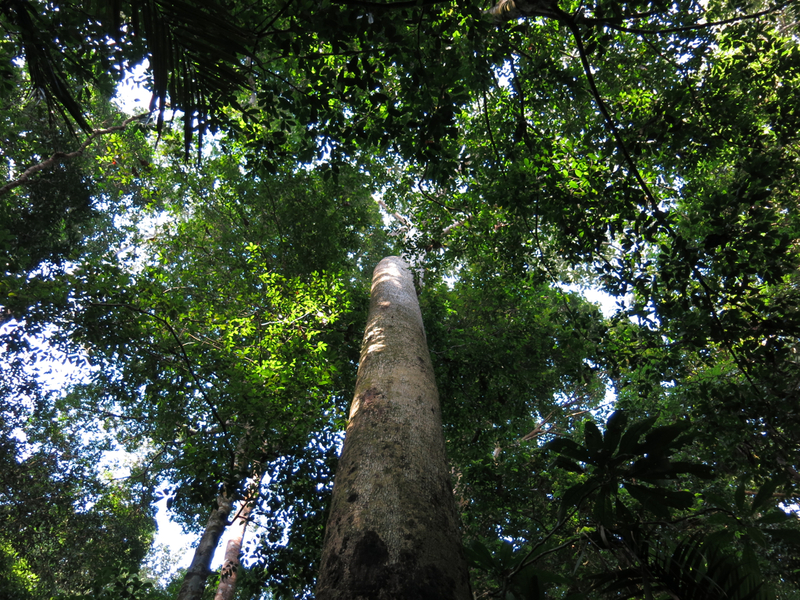 The drive should take approximately 45 minutes to an hour from KL city centre.